Underground Overlord brought to justice. New information from an un-named member of the public has led to a well known personality being brought to justice. Earlier this week the accused, who cannot be named for legal reasons, was questioned by the Lawn Police in connection with lawn crimes. Although details are sketchy at this point, we do know that the accused is not a local, and comes from over the hills and far away. A spokesman for the Lawn Police said "Obviously I am not in a position to name the guilty party before a fair trial, but I will probably talk about it down at the pub later. I would like to thank the member of the public who stepped forward and gave information leading to the arrest, and also for the nice custard." 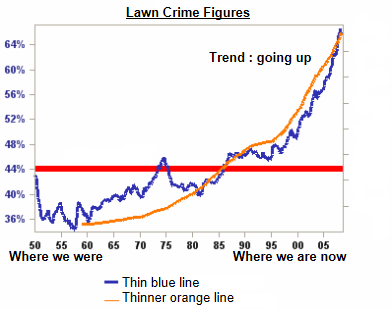 Figures released earlier this month would seem to indicate a rise in lawn crime (see Fig. 1), not just overgrown lawns but also an increase in unsightly weeds. In fact one person we interviewed had so much weed, they had forgotten they even had a lawn. If you have information regarding lawn crimes,please call the Lawn Police on 0800 LAWNPOLICE (0800 529676) - be a Grass. nb. this is completely made up for the purpose of having a bit of a giggle. Characters are not actually real, so any parallels with real people and events are unlikely, but if that happens it's purely coincidental. 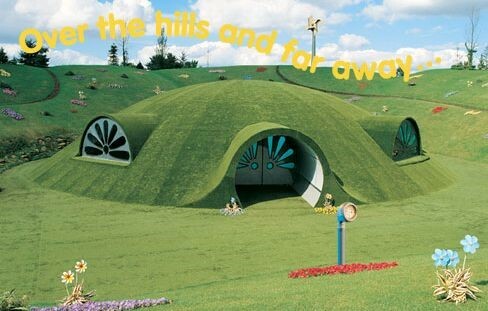 No Teletubbies were hurt in the making of this website. © 2012 Lawn Police. All Rights Reserved.